CICS Web Support is an effective solution for the VSE/ESA user community. It is a powerful 2-tier Web enablement solution that is easy to plan for and simple to implement. Our goal for this IBM Redbooks publication is to provide you with the information to use this great e-business connector. CWS unites browser technology with S/390. This provides tremendous flexibility to the end-user community while capitalizing on S/390 performance, reliability, scalability, availability, and data integrity. 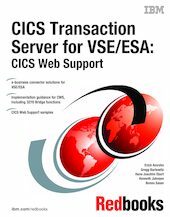 This book discusses and positions the new CICS TS for VSE/ESA 1.1.1 CICS Web Support (CWS) and 3270 bridge. It provides a broad understanding of the new architecture, together with examples and samples to help customers in their planning and implementation of CWS. CWS employs a unique approach for using an e-business connector in the VSE/ESA environment. This book also discusses planning for CWS, installation, and customization. It provides the guidance you need to design new solutions and upgrade existing solutions.